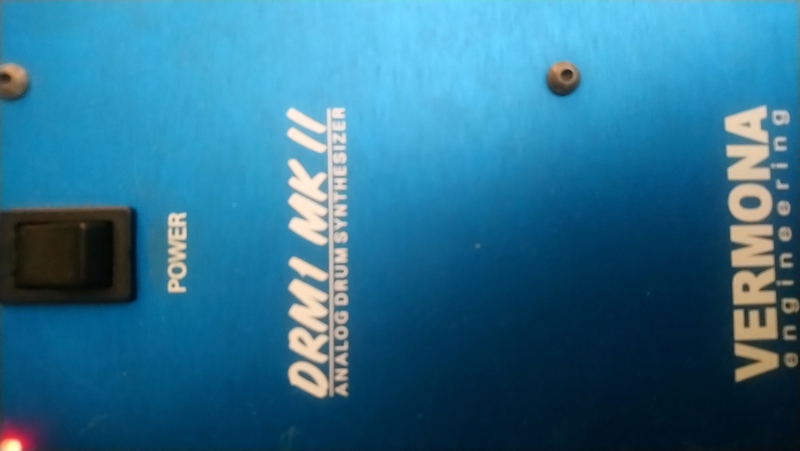 DRM1 MKII, Drum Machine from Vermona. 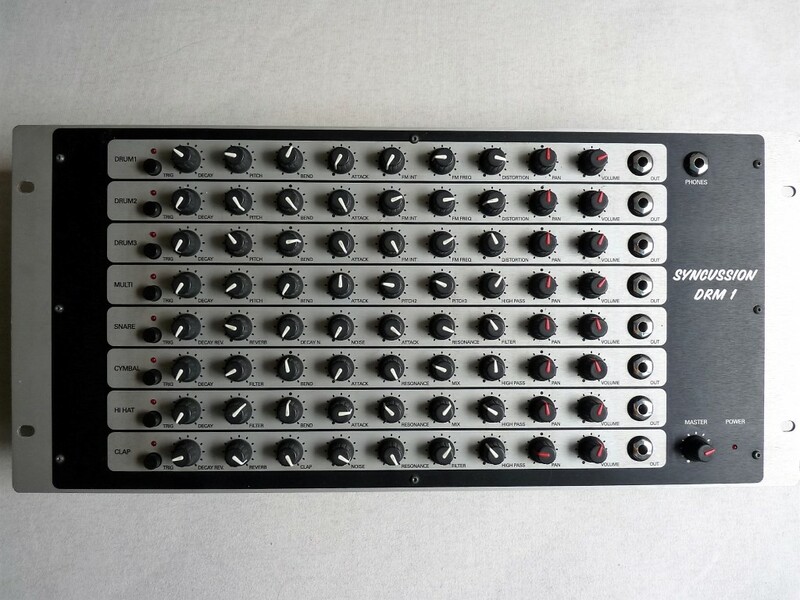 The DRM1 MKII is an eight-channel, completely analog drum synthesizer. It gives you total control over every parameter through its 72 controls. There are eight channels, each featuring specific parameters for generating a certain kind of drum and/or percussive sound. They are divided into: three DRUM channels one MULTI channel one SNARE channel two HI HAT / CYMBAL channels one CLAP channel In addition to the main stereo output, every channel is also equipped with an individual output/insert jack, which allows you to insert external effects. The DRM1 MKII can be triggered via MIDI - MIDI channel and note number can be freely assigned. I've had this unit for a few months and it has already redifined the percussive sound in my music. I sequence the DRM1 with the Roland R8 & as a Midi instrument in Logic. The only flaw I have found is that when the Main output volume reaches a certain level, depending on where I am, radio frequencies can be heard, though ever so slight. Keep in mind that this is only apparent when monitoring through the headphone jack, and cannot heard heard when the Main 1/4in outputs are used. Each channel has its own output/insert jack on the front panel. The rear panel features the master output (L/R), as well as the MIDI IN and THRU jacks. Once sequenced, the control knobs are very easy to use. The manual makes learning the logistics a snap. I have the DRM1 mounted in a tilted tabletop rack with an Avalon Tube Compressor & a Lexicon MPX550 Effects Processor. The knobs are solid stainless steel and rotate very smooth. 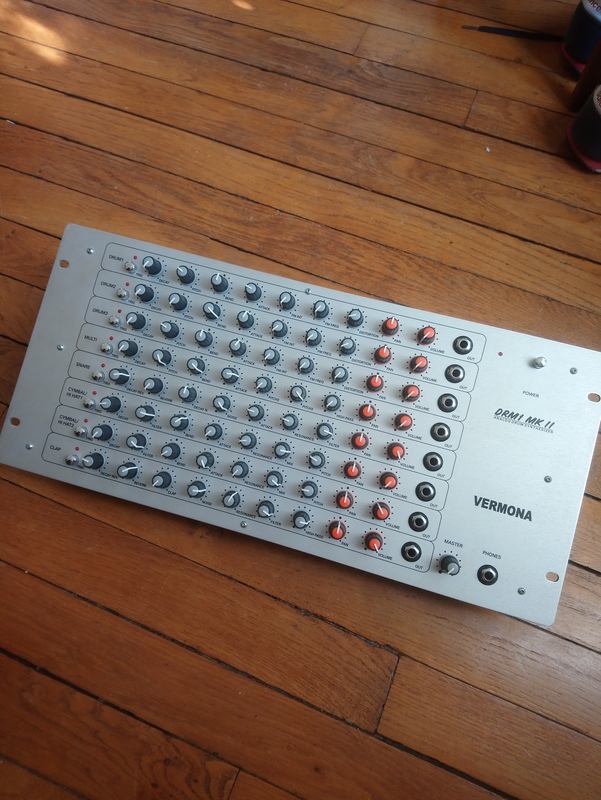 I did a lot of research on this unit before purchasing it, and the information I was able to obtain from Vermona was precise. As a true analog percussion module, I am very pleased with the sounds. The Multi channel when used as an effect insert produces some truly sonic pulsewaves. 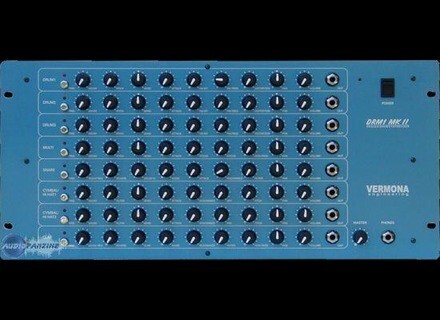 I use this module when producing Techno & IDM. Yes, I love this machine. It has it's own cover and likes to be read to at bedtime. I have no problems with this at all. Very easy to use. basic midi (channel 10) that synced right up to cubase, no problem. Awesome. sounds really cool with an 808 as a companion. i actually think i like it better than my 808! NEVER thought i'd say that. how many sounds available style? if you do not like the synthesis, modulation, experimentation ........ there is no better! sound very very ,, electro! So 8 sound sections ..
the March 1 sections are the same .. DRM1, 2, 3.
the's kick may be small, dry, bright, or large, monstrous! make 808 or 909 ... the finger in the nose! but goes further than a.
the electro aficionados will become completely crazy! a rgal. a spring reverb gives an inimitable depth. probably the hardest adcrire ..
the too much like a spring reverb snare. a killer! no possible backup. MIDI as simple as possible ... people who love the sounds ... everything go your way. single machine, ultra prcis, barely touching a knob of a millimeter, the sound changes complement. the possibilities are standard. all the boxes a rhythm that sounds a cot in Vermona, sounds small, small ..
ever think for one second to resell. Well you should still a sequencer, it's not a box so TR909 rhythms. It does not work alone what! The bass drum (if you can call it that) are special, and fat distortion of each elements wreaks havoc. It twisted around and say it's fine! Amateur its realistic forget on the beast, big on electronics, and modulation simple and effective, it is a beast not to be missed! 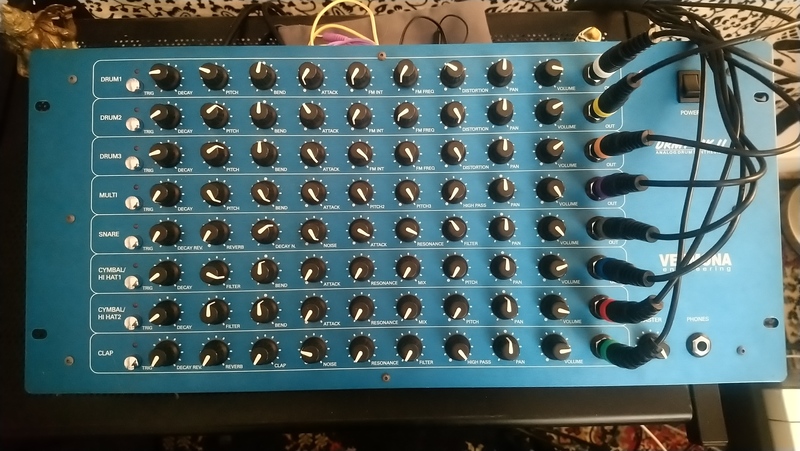 I use it for some months, it's exactly the kind of machine that I love, the kind of Becane simple, intuitive and just full of errors that make your music is not 'basic / boat'. I love this machine, I do not part with it!